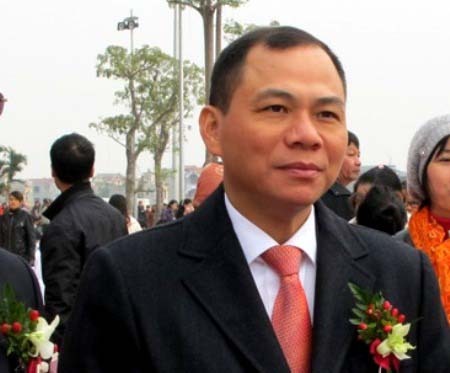 HA NOI (VNS) — Pham Nhat Vuong, founder and chairman of the Vietnamese conglomerate Vingroup, remains Vietnam's sole billionaire, US business magazine Forbes announced on March 3. This is the second time Vuong has been named in the list of the world's billionaires. He has a net worth US$1.6 billion, an increase of $100 million over last year. The ranks of the world's billionaires continue to scale new heights and stretch to new corners of the world. As many as 1,645 billionaires were found with an aggregate net worth of $6.4 trillion, up from $5.4 trillion a year ago. The estimates are a snapshot of wealth as of February 12. Vuong ranks 1,092 this year, sliding 118 spots from last year's rank. He could have kept his rank if his net worth had reached $1.85 billion. Forbes valued that in the past year, Vuong had been busy raising funds, netting $1 billion through a mix of asset sales, loans, private equity deals to fund dozens of property projects across the country. He completed two major property developments including Vincom Mega Mall Royal City, which is touted as Asia's largest underground retail and entertainment complex. These moves boosted Vingroup's shares by 15 per cent last year.